Which covers all company functions not just credit card compliance. Here is our most popular post http://oversitesentry.com/90-cc-machines-have-default-password/ 90% of Credit Card machines have been shown to have default password – this is a very dangerous thing. But the new EMV standards shouldn’t detract from a restaurant’s commitment to PCI compliance, says Bob Russo, general manager of the PCI Security Standards Council, a nonprofit that establishes standards for all organizations that store, process, or transmit credit card data. In fact, Russo says, EMV and PCI standards are best used together, as merchants do in many European countries that meet both standards. 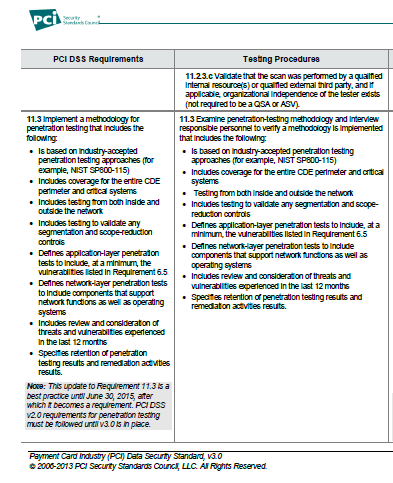 So even though there are new EMV standards – there will still be PCI DSS3.0 compliance. Updated 01/08/2015 added youtube video on PCI compliance at tip of day segment – 3rd min. 4 different levels of compliance. Contact Us to help you design a security policy to defend against an audit.